In 2017 a new Drone Regulation came into force in Germany. 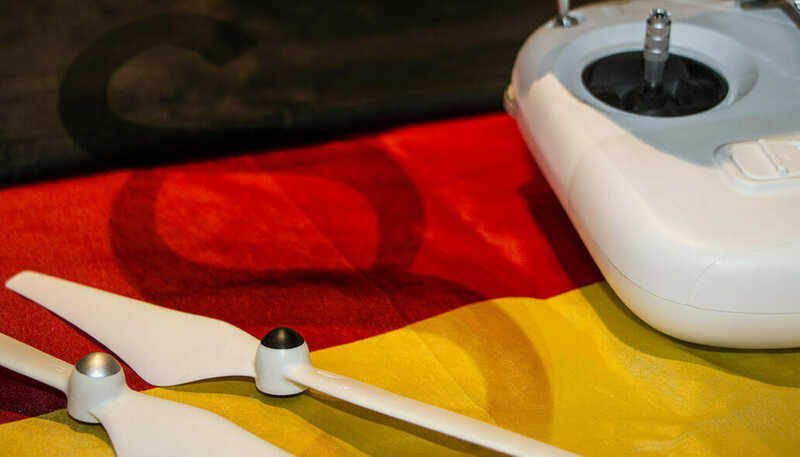 In this post, we introduce you to all the relevant rules you need to know when you plan to fly drones in Germany. Maximum flight altitude: Multicopters can only fly up to a height of 100 meters above ground. You are only allowed to operate higher if you are on an approved model airfield or have obtained a permit from the responsible civil aviation authority. If you are in controlled airspace, there is a maximum ascent height of 50 meters. Maximum horizontal distance and FPV: We speak of out-of-sight flights when, as a controller, you no longer observe the copter with the naked eye, but rely on a monitor or video glasses to control it. If these restrictions are not enough for you, you can request a permit for out-of-sight flights with the National Aviation Authority. However, this approval is only granted to unmanned aerial vehicles with a take-off mass of more than 5 kilograms. Compulsory insurance: You are obligated to buy drone insurance for operations in Germany. This company offers insurance for drones in English. But according to German laws, companies can only sell you insurance when you live in Germany. Maximum take-off weight (MTOW): Up to a weigh of more than five kilograms you can fly your drone without a permit as long as you comply with other rules. If you want to operate a drone with a weight of more than two kilograms, you need a German drone license (“Drohnen-Kenntnisnachweis“). Distance to airports: A safety distance of 1.5 kilometers must be observed to the outer borders of airports. Crowds (Group of more than 12 persons). Disasters, disaster areas, locations of authorities and organizations with security responsibilities. Federal highways, federal waterways, and railways. Prisons and facilities of the penal system. Bundeswehr installations and troops as well as other military facilities and organizations. Power generation and distribution plants (power plants, wind turbines, substations, etc.). Facilities in which activities requiring protection level 4 by the Biological Agents Ordinance (institutes in Hamburg, Berlin, Marburg and on the island of Riems) are carried out. Lands of constitutional organs of the Federation and the federal states as well as upper and highest federal and state authorities. Diplomatic and consular representations (embassies). International organizations in the sense of international law (UN, EU, NATO, etc.). Land of police and other security agencies. This already limits many maneuvers. Even in rural areas, there can be significant limitations. You can find a good map here, which takes into account the many new flight bans. The Civil Aviation Authority can grant permits to fly in these areas. Unfortunately, every federal state has his CAA. Each CAA handles the permits differently. It depends on your flight location if you can get permission to fly in the areas mentioned above. Flight bans: Overflight of residential property is prohibited if the copter weighs more than 250 grams or is capable of collecting, storing, or transmitting optical data, acoustic data or radio signals. For flights with the usual camera drones, the consent of the person whose rights might be affected must be obtained. Thus, the owners and possibly tenants must be asked if they agree with the overflight. Time of operations: Drone flights during night time is only allowed with a special permit. Specific legislation: Multicopter should be labeled with the data of the controller so that in case of damage, the causer can be determined. A badge is mandatory from a take-off mass of 250 grams. On the drone badge, your name and address must be noted. I think it makes sense to attach the phone number additionally. The legislator has made demands on the material of the identification mark. So the badge must be fireproof. The Federal Ministry of Transport and Digital Infrastructure (BMVI) itself says that an aluminum sticker with address engraving is suitable for labeling. Regulations for commercial pilots: With the new drone regulation from 2017, the previous separation for a drone flight is mostly canceled, and now the same rules apply to leisure pilots and commercial users. That’s a positive thing to say because, in my opinion, professional users have been significantly disadvantaged so far. We have researched the listed drone regulations for Germany to the best of our knowledge. We cannot guarantee the correctness of the information. If you want to be on the safe side, contact the competent aviation authority. Alternatively, you can also ask the embassy in your country for further information about the regulations. Please leave us a comment when you receive news and/or gain experience with your copter in Germany! i have ryze tello drone. it weighs 80 gms and has a camera and can fly max upto 10m ht. Can i fly it open grounds or near monastery or in forest in germany?? Drone should also have a special, fireproof tag with name and adress of the owner. I have holy stone 700 drone. It weighs 372 grams. Do i need to register somewhere? What are the steps i need to take to fly my drone. At the moment, you don’t need a registration for Germany.